Click to view how the image was produced (animated gif). Jason Gurley’s remarkable book exists, like its protagonist, in the liminal space between worlds; like much of Stephen King’s work, its setting is a richly-textured reality (geographic, temporal and emotional) into which elements of fantasy intrude and against which they are made all the more vivid. This balance of the worldly and the other-worldly was, along with a strong sense of character, the main idea the cover needed to convey. After exploring a few different routes I hit upon the idea of a double exposure; the uncanny collision of worlds that happens when two photographs are taken on the same frame offered a compelling solution. The purist part of me would have loved to capture an authentic, in-camera double exposure. Funds for casting and location shooting being sadly unavailable, Plan B called for picture research and some experimentation in Photoshop. Finding the right Eleanor was key – we needed an image that conveyed a real sense of character, without imposing a particular look on the reader. 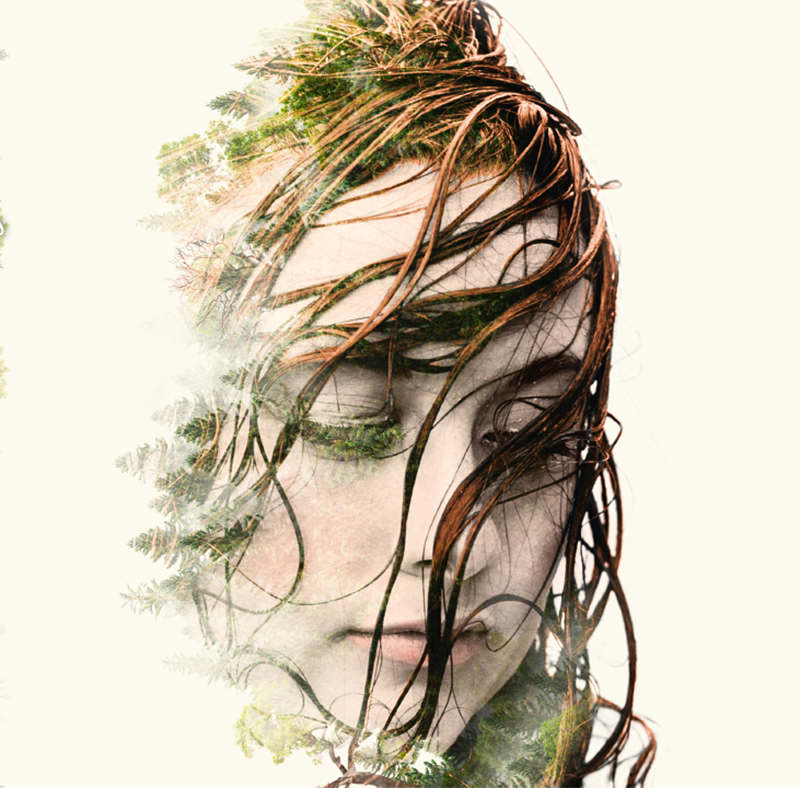 A close-up of a young woman (© Eva Creel / Arcangel Images), swathed in wet hair, with eyes closed had the right combination of the intimate and the mysterious. Although very striking in black and white, the book needed the warmth of colour, so adding that was the first task. Then to create the double exposure effect. I tried overlaying some landscape shots but nothing quite worked in the way I was imagining. Since I’d already abandoned the authenticity and serendipity of a genuine double exposure, I decided to go the other way and take advantage of the control offered by Photoshop. Building up the landscape later by layer, placing individual trees (sourced from shutterstock.com), I was able to determine both the overall shape and which parts of the face to retain and which to conceal. A few layers of mist between the tree lines completed the ethereal effect. ELEANOR is out in hardback on 12th March. You can pre-order a copy right here. Can’t wait to get your teeth into the story? Download the ebook now.